After a year of hardships, including a messy breakup with her longtime boyfriend Phil, the prospect of her mother’s remarriage, and heartbreaking patient losses at the hospital, Olive is ready to start fresh. But when she wakes up in her ex-boyfriend’s bed on New Year’s Day 2011—a day she has already lived—Olive’s world is turned upside down. Shouldering a year of memories that no one else can recall, even Olive begins to question herself—until she discovers that she is not alone. Upon crossing paths with Sherry Witan, an experienced “repeater,” Olive learns that she has the chance to rewrite her future. Given the opportunity of a lifetime, Olive has to decide what she really wants. Should she make different choices, or accept her life as she knows it, flaws and all? Andrea Lochen earned her Master of Fine Arts in Creative Writing from the University of Michigan. 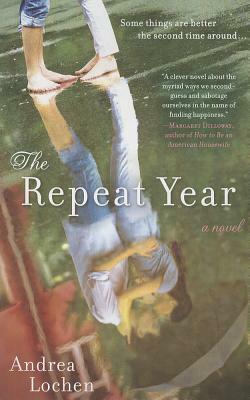 While there, she won a Hopwood Novel Award for a draft of The Repeat Year. She currently lives in suburban Milwaukee with her husband and teaches Creative Writing at the University of Wisconsin-Waukesha. For more information, visit www.andrealochen.com.